MILLIGAN COLLEGE, TN (Sept. 30, 2013) — The Milligan College theater and music areas will present the musical “Godspell,” Oct. 24-27 in the McGlothlin-Street Theatre in Milligan’s Gregory Center for the Liberal Arts. Performances will begin at 7:30 p.m. on Oct. 24-26. A matinee performance will begin at 2:30 p.m. on Oct. 27. General admission is $8; tickets for children, students and senior citizens over 60 are $5. Tickets go on sale Oct. 1, in the Milligan Bookstore. 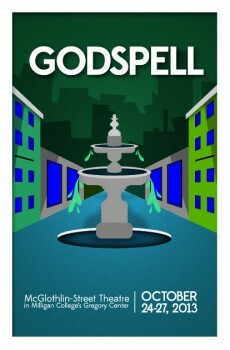 Drawing from various theatrical traditions, such as clowning, pantomime, charades, acrobatics and vaudeville, “Godspell” is a groundbreaking and unique reflection on the life of Jesus and brings his parables humanly and hearteningly to life. The play is produced by Major, with scenic, lighting and costume design by Milligan’s Pamela Adolphi. Charlotte Anderson, assistant professor of the practice of music, will serve as vocal director, with Noah DeLong, assistant professor of music, as vocal co-director and pianist. Kellie Brown, associate professor of music, will serve as musical director. Kathryn Handzlik, a senior from Chalfont, Penn., is the stage manager. She is assisted by Tess Evans-Shell, a junior from Roanoke, Va. Rachel Owens, a recent Milligan graduate from Jonesborough, Tenn., will serve as the choreographer for the show. The cast features Matthew Rees in the role of Jesus. He is a senior fine arts major from Redford, Mich. The roles of John the Baptist/Judas will be performed by Caleb Shaw, a music educator in Washington County, Tenn. They are joined by an ensemble cast of talented student actors and crew members. The production is one of several special events to be held on campus during Milligan’s annual Homecoming festivities. To purchase advance tickets, visit the Milligan College Bookstore, open Monday through Friday, 8 a.m. to 5 p.m. (and until 6:30 p.m. on Tuesdays and Thursdays) or call 423.461.8733.